Yes, everybody has a movie collection in digital files. Some of the movies are downloaded online, some are purchased from iTunes, Amazon, Netflix and more, and even some are homemade from video clips using movie maker. For multiple purposes, a part of movie video owners are eager to burn them to DVDs. Well, this instruction explains how to free burn a movie to DVD on Windows (10) using the best free DVD movie burner. What Is the Best Free DVD Movie Burner? Windows DVD Maker is the most famous DVD burning software which drives Windows 7 users to burn videos and pictures to DVD with ease. But, the limited support for input video file types (incompatible with MKV, MP4, FLV etc,) and removal from Windows 8/8.1/10 push users to pick third-party free DVD burners. A piece of disc burning software with straightforward interface is quite greater. 2. Be powerful to free burn a movie to DVD. The most common formats of movie files are MKV, MP4 and AVI so that the DVD burning software should support the above formats. And, the more movie file types the software accepts, the more powerful it is. As for output, a great free DVD movie burner is required to burn a movie to DVD disc, or additional DVD Folder, VOB file. Certainly, all of us prefer a fast free DVD movie burner. 3. Be clean and safe. Some free DVD movie burners are bundled with adware (for example ImgBurn) or even spyware, malware or virus. A totally safe and stand-alone tool is quite necessary to keep your computer in secure. WinX DVD Author is the qualified free DVD movie burner for Windows 10 and lower versions. It is available to burn movies in MKV, AVI, MP4, WMV, MOV, FLV (YouTube), MPEG etc, to NTSC/PAL DVDs, DVD Folder and VOB files retaining high quality in a few clicks. It provides customized settings enabling users to add chapter menu, burn DVD movie with subtitles (.srt) as well as import menu background music. This best free DVD movie burner is fully compatible with DVD+/-R, DVD+/-RW, DVD DL+R, DVD DL+/-RW. How to Free Burn a Movie to DVD on Windows (10)? • A movie video file or several movie clips for burning as DVD disc. • A blank DVD disc. • Download and install WinX DVD Author on your Windows computer. After that, follow the tutorial to free burn a movie to DVD on Windows (10) step-by-step. Insert the blank DVD disc into optical drive and Launch WinX DVD Author. Tap Video DVD Author button to access to the new window. Click + button on the bottom of interface to add movie source(s) and then hit Setting button to get a smaller dialogue for customizing DVD aspect ratio, format (NTSC/PAL), Type (DVD-5/9), duration, language and subtitle depending on your needs. Tap Next Step button and you will be leaded to personalize title/chapter menu for DVD. You can change menu background image, add music/text and remove title/chapter from menu. Tap Next Step button and a dialogue box appears. There are three sections on the dialogue. The first one is DVD Burner listing DVD disc name, write speed and disc volume. The second section is Output Property enabling you to set output folder, format and encoder engine (for quality and speed). If all those are well-organized, click Start button to burn the movie to DVD. In addition, WinX DVD Author can help you convert movie file(s) to VOB or DVD folder for later burning as a DVD disc as well as download movie trailer/clips/soundtracks from YouTube and then burn them to DVD for free. Disclaimer: Digiarty Software does not advocate ripping/burning copy-protected DVDs for any commercial purpose and suggests referring to the DVD copyright laws in your countries before doing so. Copy and rip any home-made and commercial DVDs with removal of copy-protections to MP4, AVI, WMV, MOV, FLV, 3GP, iPhone, iPad, Android, PS3/4, Xbox, etc, at No.1 fast DVD rippping speed. On this page you will find how to burn full MKV elements to DVD disc, say create MKV DVD with chapters, menus and selectable language/subtitle tracks. 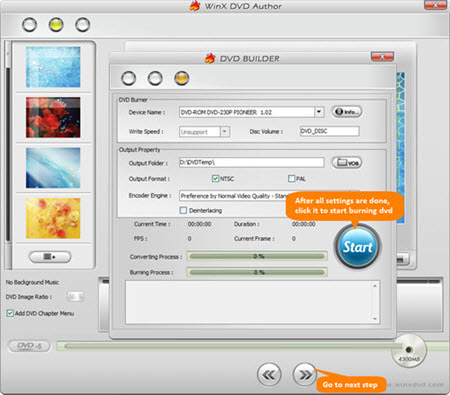 WinX DVD Author is a not only a free VOB to DVD burner to free burn VOB file to DVD disc on all Windows OSs, but also a video to VOB converter, VOB editor and so on. It gives you a full review on 2018 best free DVD burner for Windows 7/8.1/10, and also learn how to burn video, e.g MP4/AVI/MKV, to DVD within a few clicks. How to Burn ISO Image to DVD on Windows 10/8/7 with Ease? How to Free Burn DVD to DVD on Windows 10 Computer?